The cell. 5. Vesicular traffic. In plant cells. Atlas of plant and animal histology. The basic vesicular trafficking roadmap of animal cells is also found in plant cells. However, plants show some distinct features (Figure 1). Vacuoles, which communicate with other cellular compartments, are prominent organelles with essential functions for the plant cell. Furthermore, endocytosis and exocytosis are not so intense as in the animal cells. Early and recycling endosomes have not been found in plant cells, and their function are carried out by the TGN (trans Golgi network) of the Golgi apparatus. Figure 1. Main pathways of the vesicular trafficking in plant cells (adapted from Hawes et al., 1999). As in the animal cells, endoplasmic reticulum is the organelle for synthesizing proteins, lipids and carbohydrates that travel through vesicular trafficking. In plant cells, there is also a quality control of protein synthesis in the endoplasmic reticulum. In plant cells, the bidirectional communication between the endoplasmic reticulum and the Golgi apparatus is peculiar because both organelles are very close to each other in the cytoplasm. There is not a central Golgi apparatus in plant cells, but many cistern stacks scattered through the cytoplasm. Some authors suggest that instead of vesicles as transporters, sometimes transient membrane bridges between both organelles allow a direct way for molecules to move from one organelle to the other. Whatever the communication mechanism between both organelles, it is widely accepted that there is no ERGIC compartment in plant cells. In plant cells, besides the Golgi apparatus, the endoplasmic reticulum is able to target vesicles to vacuoles. This vesicular pathway has been suggested because some storing vacuoles may contain a high proportion of non-glycosylated proteins. However, endoplasmic reticulum and vacuoles are not connected directly but by an intermediate organelle known as intermediate compartment, which fuses with storing vacuoles. Furthermore, some experiments suggest that there is a direct vesicular pathway between endoplasmic reticulum and plasma membrane. Vesicles that move from endoplasmic reticulum to the Golgi apparatus follow the default pathway. The Golgi apparatus has a relevant role in plant cells because most cell wall carbohydrates, but not cellulose, are synthesized in this organelle. From the Golgi apparatus, vesicles are also targeted to prevacuolar compartments, which fuse with vacuoles, both lytic and storage vacuoles. 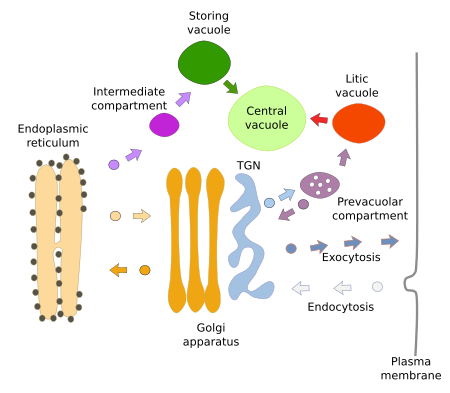 Pre-vacuolar compartment sends back recycling vesicles to the Golgi apparatus, like the multivesicular bodies/late endosomes do in animal cells. In differentiated cells, lytic and storage vacuoles can fuse with each other, which has effects on vesicular traffic pathways. Proteins targeted to vacuoles, either lytic or storage, must have a signal peptide to be recognized in the TGN of the Golgi apparatus. However, it is unknown the recognizing motif for proteins included in vesicles toward the plasma membrane. The default pathway for vesicles departing from the Golgi apparatus is toward the plasma membrane, mainly intended for membrane homeostasis and for releasing cell wall molecules. Endocytic vesicles fuse with pre-vacuolar compartments, with the Golgi apparatus, or directly with vacuoles. In plant cells, the endocytic pathway is poorly known and it seems less prominent than in animal cells. Although plant cells show endocytosis and contain the molecular machinery for that, some proteins are missing. For example, Rab proteins involved in phagosomes, cilia and lysosomes have been probably lost during evolution in plant cell lineage. Caveolin mediated endocytosis is also missing. In plant cells, endocytosis is mediated by several factors; for example, auxin hormone controls the transport of metals and therefore the absorption of metals by roots. In plant cells, primary and recycling endosomes are not as well characterized as in animal cells. It has been suggested that the TGN of the Golgi apparatus may perform the function of these types of endosomes. However, prevacuolar compartment has been homologized to multivesicular bodies/late endosomes of animal cells. Prevacuolar compartment are generated from TGN of the Golgi apparatus and partially from the endoplasmic reticulum. Plant cells do not show typical lysosomes, and degradative processes occur in lytic or digestive vacuoles. Vacuoles are membrane-bound organelles with a variety of functions (digestion, storaging, maintaining hydrostatic pressure, and many others). They may also show different sizes and shapes. Although functionally distinct, vacuoles can fuse between each other to form a large vacuole in differentiated cells. The central vacuole is very important because it regulates the hydric balance of the cell. Lytic vacuoles are similar in function to animal cell lysosomes because they are in charge of degradation processes. Storage vacuoles are needed during seed germination and are involved in the responses to certain environment changes. In plant cells, there is a membrane-bound organelle present just during cell division. It is known as phragmoplast. It is a cell structure made up of microtubules and vesicles that gives rise the two plasma membranes that separate the two new cells during cytokinesis, and it is also in charge of the formation of the middle lamella of the cell wall, which is built between both plasma membranes. Vesicles from the two Golgi apparatus, one per new cell, are targeted to an intermediate space between the two mitotic nuclei. In this space, vesicles fuse to form the middle lamella. This is the default pathway for vesicles coming out from the Golgi apparatus during cell division. Hawes, C.R., Brandizzi, F., Andreeva, A.V. Endomembranes and vesicle trafficking. 1999. Current opinion in plant biology. 2:254-461.